First, Politico has the full text of the 142-page document Republicans are calling a "discussion draft." Three Republican senators can defeat the bill by joining Democrats to vote against it. FiveThirtyEight reports the most likely candidates are Rand Paul and Mike Lee (who don't believe it goes far enough; Paul recently said he doesn't want "ObamaCare lite") and Susan Collins and Lisa Murkowski (who want more protections for Medicaid and pre-existing conditions). ABC News reports four Republican senators have already said they won't vote for the bill without more information and negotiation: Paul, Lee, Ron Johnson, and Ted Cruz. They released a joint statement saying the bill doesn't do enough to repeal ObamaCare. The bill's writing was cloaked in such secrecy that the Week reports as of Thursday morning quite a few Republican senators still had not seen it; Murkowski, for example, told a reporter, "I am not a reporter, and I am not a lobbyist, so I've seen nothing." President Trump had called the House bill "mean" and in need of "more heart." So Scientific American takes a look to see if the Senate version fulfills that requirement. When asked by a reporter if the Senate bill had enough heart, Trump called it "very good" but in need of "a little negotiation," CNN reports. 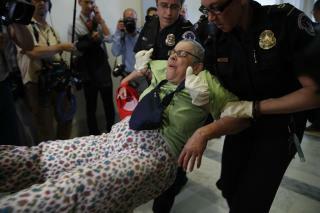 According to People, police dragged protesters—some of them in wheelchairs or wearing medical devices—away from Mitch McConnell's office and arrested them. The protesters, members of a national disability rights group, say people with disabilities are threatened by the bill. Finally, USA Today reports Senate Democrats plan to fight the bill through procedural requests to slow down the process. They called for any changes to the House's bill to be made public for at least 72 hours and be subject to CBO analysis. "Murkowski, for example, told a reporter, "I am not a reporter, and I am not a lobbyist, so I've seen nothing." That says it all right there; the lobbyists for the insurance and drug companies wrote the friggin' thing so they can make billions and take people's social security checks paying for drugs and treatments that will be dropped from Medicaid and Medicare coverage. I hope the one-percent CHOKE to death on their bundles of money they won't be paying in taxes. I think the Republicans should just take a breather and let ObamaCare implode. Rushing through a replacement is not the way to go. Everyone wants free healthcare...there is no such thing. But, people should not be deprived of coverage because of pre-existing conditions nor age. The Republicans have had 7 years to come up with a viable plan...just DO IT! Access to healthcare aside, i wonder if they thought about what is going to happen to the economy when you take a trillion dollars out of it.